Every year the top pros in Motocross spend time testing and tweaking the settings on their dirt bikes. Much of this deals in the art of suspension. It's a finicky thing and for finicky riders it can mean the difference between stepping on the podium and simply finishing. Most riders manage through a bad set-up, at least for a while, but the fatigue eventually sets in and quickly tires the most seasoned veteran. That's why the suspension set-up is so crucial. So, if you need replacement parts for warn out seals or bushings, new springs or a linkage arm, MotoSport is the best place to dial in your dirt bike's suspension. 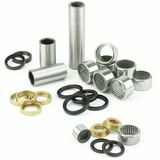 We carry everything related to the suspension set-up including bearing kits, fork adjuster, fork bleeders, fork oil, lowering kits and all the tools required to get the job done. Use a sag scale to get your suspension settings just right. 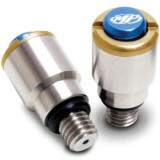 Grab a holeshot device to improve your starts. A finely tuned suspension might provide that edge to finally get into the Top 10 or allow you to blaze the trails for an afternoon without feeling exhausted after an hour. Give us a call at 888-676-8853 with any questions regarding dirt bike suspension or use the Live Chat. We'll get you the parts by race day and orders more than $79 ship free.